James Preston Cobb of Bryant Pond passed away on Friday March 23rd, 2018. He was born on February 1st, 1931 in Lexington, Massachusetts to Horace and Lola (Merrill) Cobb. He was raised in Sumner, Maine on the family farm. 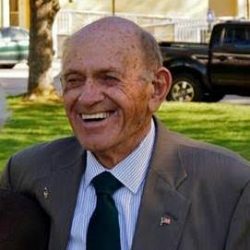 He graduated from Buckfield High School in 1951 and joined the U.S. Army as a member of the Signal Corp. Jim spent time training in South Carolina, Texas, and Alaska. He married the love of his life, Mary Annette Emery, while home on leave the 22nd of June, 1952. Upon returning home in 1953, Jim began working as a carpenter until finding a job as a millwright at P.H. Chadbourne’s sawmill. He continued working at the same job even after the mill was sold to Hancock Lumber. When he finally retired, Jim helped many friends and family complete projects including his son’s log cabin. He was known for being able to build or fix anything. There was never a project he would not tackle or a person he would not help. He had a passion for dancing and he was married to the only dance partner he ever wanted. Jim and Mary could be found waltzing around the dance floor anytime the opportunity arose. They attended most dinner and dance nights at the American Legion even as his health declined. His second passion was fishing. He loved fishing anywhere, but his favorite place was at the family camp at Kennebago Lake. He always had a broad smile on his face as he talked about the many brookies he brought in over the years. He especially enjoyed sharing the boat with one of his grandchildren. A favorite story included a fish and a crazy Loon determined to eat his fish. He also enjoyed riding the lawn tractor while mowing the multiple acres of grass surrounding the house he and his family built together. God was always most important to Jim. 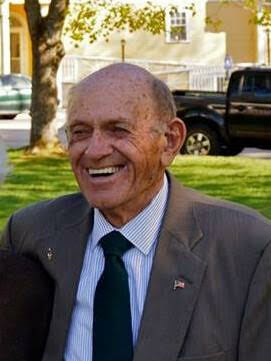 He was a 49 year member of the Bethel Church of the Nazarene, serving as a board member and music director. He was the Chaplain at the Maine Veterans Home in South Paris from the day it opened. He and Mary recently received the Distinguished Service Award from the Nazarene Church. Jim also traveled on service trips to use his masonry skills to assist in building churches in Costa Rica and Venezuela. Jim is survived by Mary his wife of 65 years and their children Llewellyn of Greenwood, Rebecca Lane and her husband Matthew of Strong, Preston of Colorado, and James A. and his wife Erika of Bethel. He had nine grandchildren and nine great-grandchildren. His sisters Jeanette Conant of Auburn and Pauline Martin of Lewiston, his brother in-laws Marland Tripp of Cape Elizabeth and Walter Emery and his wife Stephanie of North Carolina. He was pre-deceased by his parents, his sister Betty Tripp, brother in-laws Clinton Conant and Allan Martin, daughter in-law Becky (Porter) Cobb and grandson Daniel Cobb. Visiting hours will be held at the Bethel Church of the Nazarene at 3:00 P.M. on Saturday, March 31st followed by the funeral service at 4:00 P.M.A committal service with military honors will be held in early summer at the Elmwood Cemetery in East Sumner.